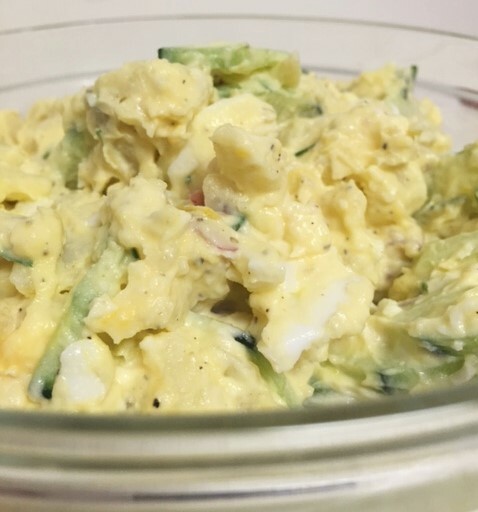 ← Easy Peach Jam with a Kick………………………..
Everyone has a favorite potato salad. I’m not a huge fan of it, but I did like my mom’s potato salad. It was really pretty basic, but it was good and the only one that I ever really liked. But then one day, several years ago, my ex boss brought a potato salad to a pot luck at the office. He said it was his mothers favorite recipe. It was gooooooooood. It was different. It had cucumbers!! 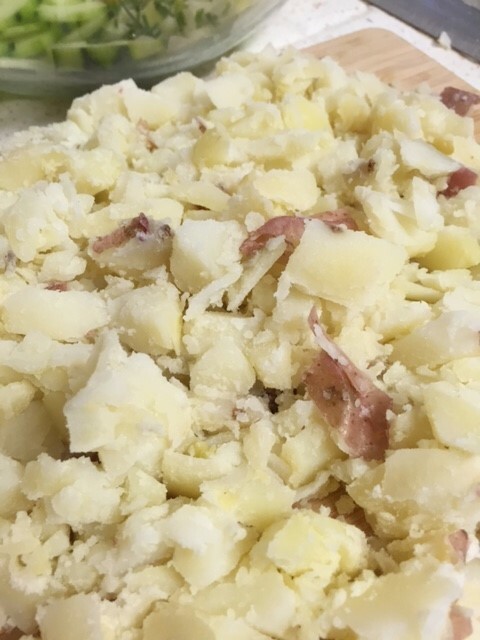 The potatoes were also mostly smashed, which I really loved. It was so different. It didn’t have boiled eggs in it, but I do add it to mine. It also has no pickle relish. BLEKHHHH, I detest pickle relish. Ok, so one day my boss confessed that he had over cooked the potatoes and they really weren’t meant to be smashed. Hahahaha, but everyone loved the fact that they were, so he stopped telling folks that the mashing was an accident. Now, you know me by now…..I love my spicy, so of course I add jalapenos to mine. But you don’t have to! 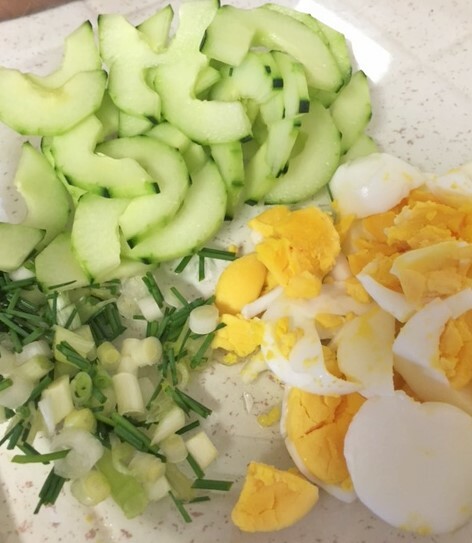 So, if you’re bored with the same ol kind of tater salad, I hope you will try this one. I know the cucumbers sound weird, but really, it makes all the difference. Yum Yum. Gads! We gave it the old college try! Looks good even though I HATE potato salad!